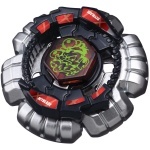 Note: This Beyblade was released as apart of the Beyblade Deck Attack & Defense Set and was re-named "Counter Scorpio 145D" and released as a Starter instead of inside a Set by Hasbro. The Face on this Beyblade depicts Scorpio, the eighth astrological sign in the Zodiac. In Hasbro's release, the "Escolpio" writing is smudged. The Escolpio Clear Wheel is of a black colour, featuring 2 "Stingers" on opposing ends of the Clear Wheel. It is the second lightest Clear Wheel available. Due to Escolpio's small shape and slopes, using Escolpio increases contact with the Metal Wheel, and decreases contact with the Clear Wheel. This is particularly useful for increasing a Beyblade's Smash Attack and its potential to destabilize the opposing Beyblade. Escolpio can be used in the powerful Smash Attack combination Flash Escolpio GB145RF/R²F. Counter is styled like a HWS version of the Metal System Leone. It possesses six similar mane-like projections that coronate its circumference. The gaps between the six projections are too small to provide consistent smash for a competitive Attack Customization. Counter still showcases fair Smash Attack, but unlike Leone, it lacks the same degree of recoil. This is because the projecting paws are more compact and rounded than its counterpart’s. The lowered recoil makes it a better, albeit underwhelming, choice for a defensive combo. If you somehow lack access to competitive wheels, Counter can be used to some degree of effectiveness in Smash Attack customs such as MF Counter Bull H145RF. This is a Defense Bottom, which acts as a wider version of a Sharp tip. When hit by an opponent, a Beyblade with this Bottom will have lessened recoil and will recover from attacks more efficiently than a Sharp Tip. However, while recovering, the Defense Bottom will cause the Beyblade to lose some stamina, caused by the added friction. D can be put to use in the combination Duo Cygnus 230D. D is a superior choice for 230 because it retains balance more easily than WD. This Beyblade features two top tier parts: 145 and D. However, considering these parts can be found in more useful releases this Beyblade should only be bought for collection purposes. This page was last modified on 12 October 2014, at 21:34.